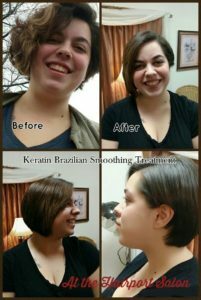 The Keratin Brazilian Smoothing Treatment is for anyone who wants shinier, smoother, healthier hair. Keratin Express works best on porous or chemically processed hair. Applications on virgin hair will show the best results after the 2nd or 3rd treatment. Wavy hair will be straight; curly/frizzy hair will be smoother with up to 100% less frizz and possible curl reduction between 10-30%. Subsequent blow-dry time will be cut up to 50%. Straightening is a breeze with a blow dryer & brush or flat iron and clients have the option to wear hair curly if they so choose. Consecutive treatments will have an increasing smoothing and straightening effect. This is achieved using Cyprosil Complex. Lock-in color, repair damage, increase strength, heal, detangle all with a keratin treatment that contains our exclusive Cyprosil Complex, which reduces processing and finishing time by up to 75%! Cyprosil Complex is a synergistic blend of cationically modified keratin and cystine peptides that produce immediate and noticeable shine and conditioning effects after just one treatment. Keratin Express is not just for curly hair, but anyone who wants to improve strength, eliminates frizz or speed up finishing time every morning! Clients also have the option to wear their hair curly, straight or somewhere in-between! 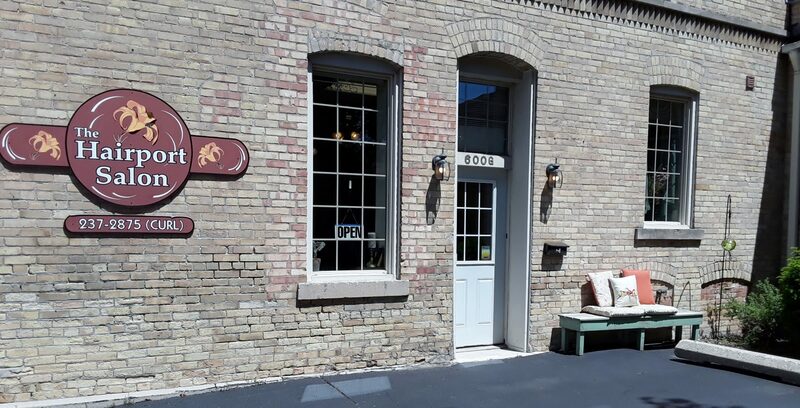 The results of the treatment after a hair color service are nothing short of amazing! Color has more shine, vibrancy and durability, and the health and strength of the hair is greatly improved. To enjoy the benefits of this treatment you must take care of your hair according to the Keratin Express guidelines. After the initial treatment do not shampoo for 24 hours, use products, get your hair wet, use bands, clips etc. The keratin needs 24 hours to bond. If you do get your hair wet, immediately blow dry and flatiron. Do not use shampoo that contains sodium chloride (salt) as it will shorten the life of the treatment. Loma and Neuma do not contain sodium chloride. Avoid swimming in salt water. This treatment costs $95 with a haircut add $15. If getting this treatment the day of a color service the price is reduced to $50.